Chimps are suppposed to be our closest relatives, but the differences are actually great (and increasing with further research). 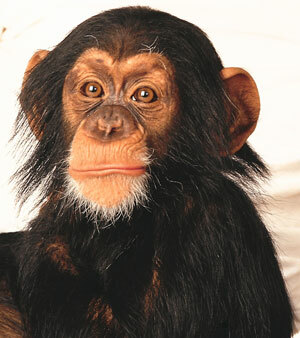 The chimp/human difference is actually 4%—much greater than the ‘only 1%’ commonly claimed in the past. 29% of the protein-coding genes are the same; leaving ~70% that are different. There are genes present in humans that are completely missing in chimps. The differences include 35 million single letter ‘substitutions’; 40–45 million ‘insertions’ and a similar number of ‘deletions’. This adds up to some 120 million letters, which is 4% of the ~3 billion total number. The differences between human and chimp DNA cannot be bridged by evolutionary processes. While the similarities reflect a common Designer, it is the differences that make all the difference—and the most important difference is that man is created in the image of God (Genesis 1:27). The Chimpanzee Sequencing and Analysis Consortium, Initial sequence of the chimpanzee genome and comparison with the human genome, Nature 437(7055):69–87, 2006.